While Josef Originals collectibles are still widely available on the internet, many of the more valuable and sought after items are getting harder to find. 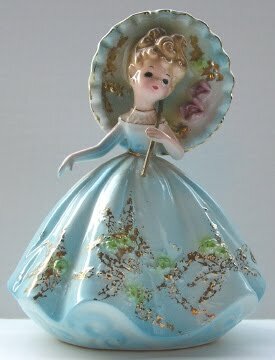 The favorites among collectors date between 1945 and 1975 when Muriel was still designing the dolls herself. So, to help weed through the clutter, this article will provide a brief history of Josef Originals and discuss how to determine a doll’s authenticity, as well as the rarer, more popular collections. Josef Originals was started in 1945 when the artist behind these quality collectibles, Muriel Joseph George, decided to stop making her Lucite jewelry (Muriel of California) due to the higher cost of producing it as a result of WWII. In the beginning, Muriel and her husband, Tom George, were operating their new pottery business out of their garage and basement in Arcadia, California. It wasn’t long before her dolls gained such popularity that cheap reproductions from Japan began making their way into the market. Naturally, this caused Josef Originals to suffer financially, so Muriel tried her hand at producing new and even better quality pieces that would be more difficult to copy. Unfortunately, this became too costly, as well. What saved Josef Originals from financial ruin was a representative and distributor of other California ceramics producers. In 1959, Mr. Good convinced the Josephs that they could greatly reduce production costs by moving their operations to Japan. So, in 1960, their new factory opened in Japan where Muriel spent some time training workers to produce her ceramics to her specifications. With production taking place on a grander scale in Japan, Muriel was now free to get creative when designing new pieces from home. Muriel would provide the factory with drawings and instructions and each piece required her approval before production would begin. Although Muriel had retired in 1981, she continued creating new designs until 1985 when the company was sold to Southland Corporation. After the Josephs sold their share of the company to their partner in 1982, the company started producing figurines with brown eyes and did so until 1985 when the company was sold. Currently, the company belongs to Applause, Inc., which produces earlier pieces with red-brown eyes and matte finishes, marking them with paper labels and signing them as “Josef Originals by Applause” or “Josef Originals by Dakin”. 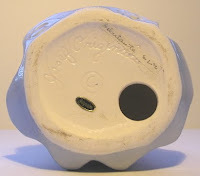 The signature black eyes, produced in both California and Japan until 1982 when the Josephs sold their share. The “Josef Originals” and circled “C” impressions on the bottom, which is lightly glazed. The earliest pieces bear the name “M.J. George”. The black oval stickers with gold or silver lettering. Those made in California will have stickers that say “Josef Originals, California”. California was later replaced with a curly-cue (shown to the left) when production began in Japan and a label with “Japan” in script was added, which is typically found on the bottom (as shown above). Of course, the most collectible pieces are those made during Muriel’s ownership, particularly those made in California. Most collectors prefer the figurines with black eyes, which were made in both California and Japan. All others were made after 1970 in either Taiwan, Korea or Mexico. Then, of course, there are those cheap reproductions that were produced in Japan beginning in the 1950s, as mentioned earlier. Naturally, the more popular dolls would be among the hardest to find as few collectors are willing to part with them. Plus, as time goes on and as unfortunate as it is, pieces do get broken and are forever lost, much to the dismay of avid collectors. So, of course, fewer become available, making them even harder to find. Most pieces are worth between $30.00 and 60.00 and some range from $75.00 to 100.00. However, there are those earlier pieces that can go up to anywhere from $125.00 to $150.00. So, if you see any of these rarer items priced below that, be sure to read the description and view the photos provided carefully to ensure there is no damage. When in doubt, ask questions of the seller. Josef Originals Little International Series – A favorite among collectors. Muriel made the original 18 dolls in 1959, but 11 more were added over the years. Josef Originals Career Girls Series (1967) – including a debutante (pictured at top), a florist, and an actress, among others. There are a few guidebooks available, which are as treasured by collectors as the collectibles themselves and, therefore, can be quite pricey as guidebooks go. However, if you are patient enough and have the time to do some hunting, you can find good deals on them. The three best guidebooks for Josef Originals are written by Jim and Kaye Whitaker, which include hundreds of photos, informative text and descriptions, and price guides. The first two books pertain to earlier pieces made during Muriel’s ownership. While both books include some of the rarer figurines, the second book seems to include more of the rarest. The third book is mainly a showcase of the Whitakers’ own collection of Josef Originals and includes photo comparisons of the Applause figurines next to Muriel’s originals. So, if you are serious about collecting Josef Originals figurines, I highly recommend purchasing the first two books as each contains some dolls that the other doesn’t. I have aquired a large quantity of plush animals that have tags, that say "Joseph Originals." Do you have any clue what these are about?